January 31st 2015 would have been the 150th birthday of Henri Desgrange – the founding father of the Tour de France. In honour of this momentous anniversary I organised a little ride around Greenwich in London in his honour.. I had done something similar – all on my lonesome – the year before but felt that I should try and get a few others to accompany me this year. “On the 31st January 1865 – 150 years ago today – a certain Madame Desgrange gave birth to twin boys, Georges and Henri, in Paris. One of those boys grew up to become a man who was described as being ‘totally devoid of all ambition’. We aren’t celebrating him here today. Fortunately for us feckless Georges’ twin brother, Henri did not lack ambition. Or drive. Or talent. Or a slightly suspect enjoyment of making people suffer on bicycles. He had the ambition and talent to hold the Cycling World Hour Record in 1893. He had the ambition and skill to become the editor of a breakaway newspaper called L’Auto. And (despite a bit of early hedge betting) he had the ambition and nerve to back an idea by one of his journalists for a mutli-stage bike race around the country. He also instantly had the realization that it should called ‘Le Tour de France’. And for that we are very, very grateful. 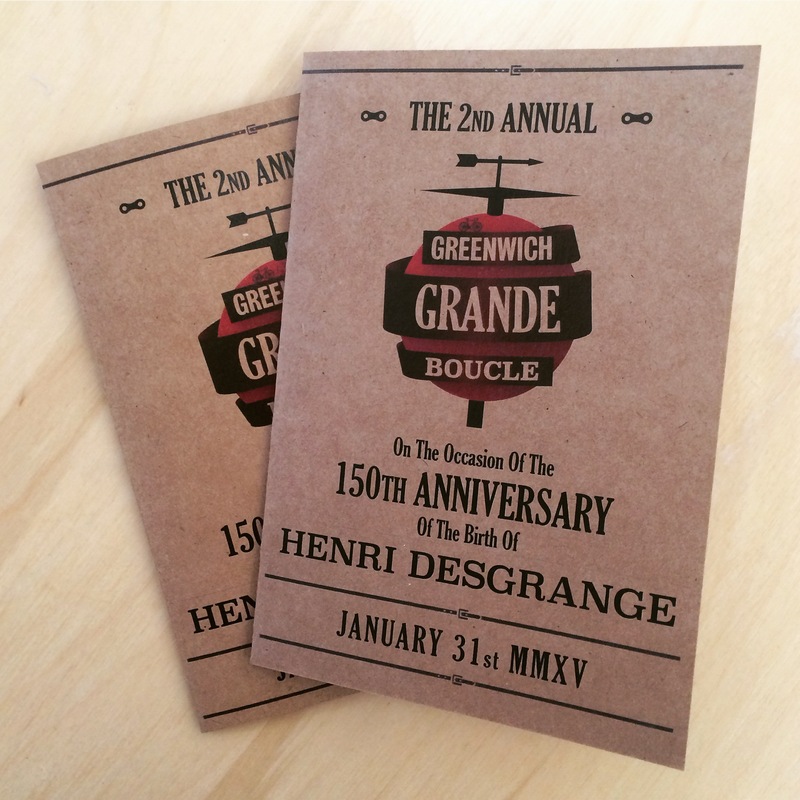 “Today’s ride is the 2nd Annual Grande Boucle. In keeping with the 1905 Tour de France this is an eleven ‘stage’ ride. There is no obligation to complete all eleven but please do come back here after for a couple of demi-pintes of Stella, or Kronenbourg in Henri’s honour. 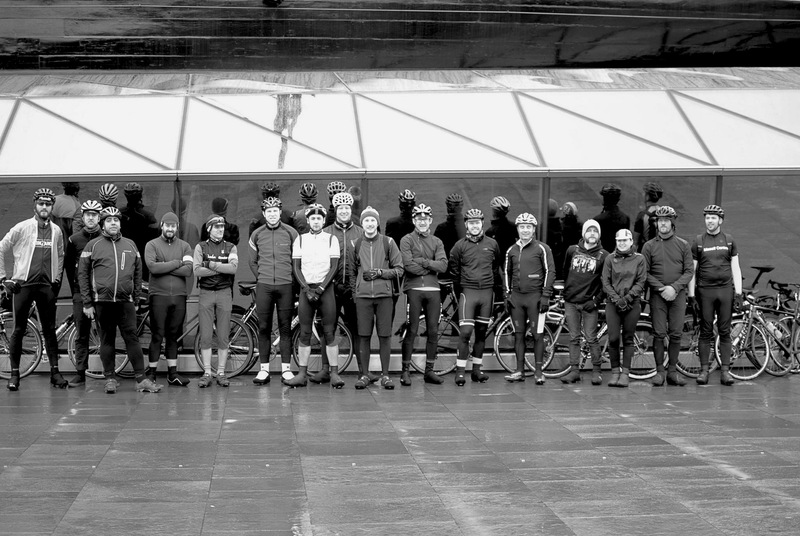 And then we were off – eleven 2.5mile laps, each with 133 feet of 10% climbing. We rode the first lap pretty much together as a bunch but by lap two it was clear that our group was a peloton of at least deux vitesses and really about four or five. The club roadies took off with the hardiest of the fixed gear guys and the rest were left in their wake on the second ascent of the cruel “Col de Crooms’ille.” By lap three the Blackheath Tea Hut, at the top most part of the course, was beginning to attract the odd rider for a brief stop for coffee or cake. Or both. As the laps began in to pile up some needed all the help they could get. 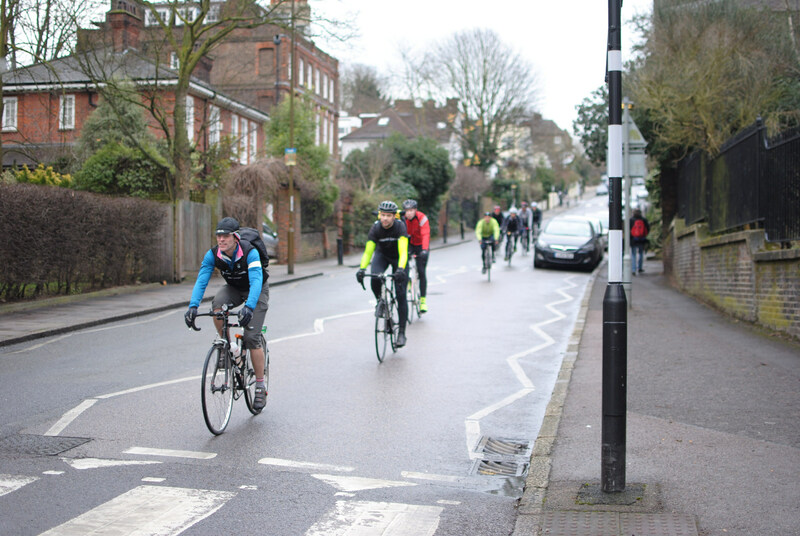 For me being cheered on by a dad on the sidelines of a kid’s football game near Blackheath Gates was a real help – it turned out later he was another cycling clubmate who hadn’t being able to join in. Others with early child-sport related duties joined in dribs and drabs as they were released from their commitments. Another enterprising rider, peeled off after a couple of laps to “go and look at a new house”. He was back by lap five so I’m guessing it wasn’t all that good.. I had dropped back from the lead group to take some photos and to ride with some of the others when reports started coming in that one our group had suffered a crank failure. I had visions of him carrying his bike down Maze Hill in search of a blacksmith á la Eugène Christophe in the 1913 TdF, or, more realistically, an expensive round in the pub for the poor chap afterwards, but I needn’t have worried. The rider in question, is Head Marshall for the Tweed Run, was fully equipped with a crank tool and managed to get himself back underway. I was impressed with his preparation. For my part I had been confined to riding the hill in the big ring as the time I had should have been spending sorting out my front mech had been sacrificed in favour of printing route cards and putting up way markers. I hope Henri appreciates that. Having done the route the previous year I was expecting there to be a degree of similarity with my solo effort but, as I found myself caught in no-man’s land between the lead group and the grupetto, it was getting far too familiar. For five laps I toiled on alone – too slow to catch up with the leaders, too stubborn to sit up and wait for them to come around again. Eventually I caught up with a late arrival whom I hadn’t seen at the start. Stuart Birnie – the world 24hr TT champion who was gamely doing the route on a newly built-up mountain bike. He had joked with me about bringing his super-aero Specialized Shiv just for the flat ‘TT’ section up on the Southern end of the Park perimeter but sense had prevailed and he had brought what he called the Balloon Bike instead. 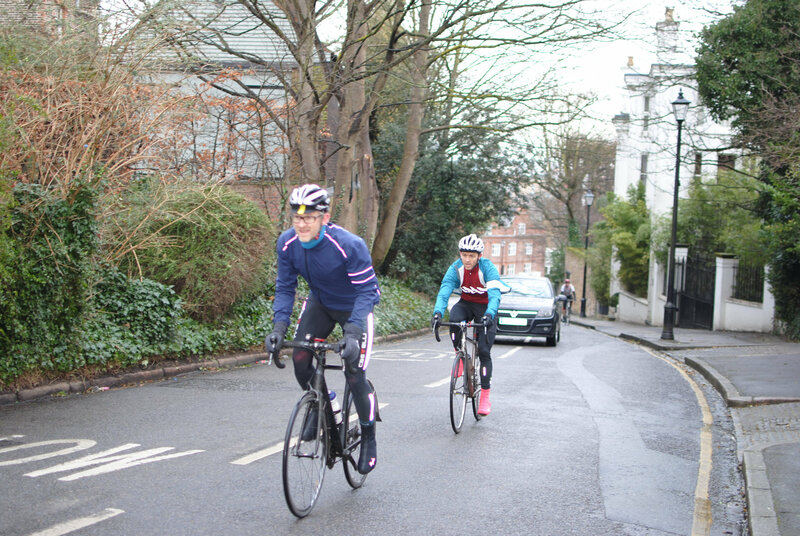 As we chatted we were caught by a flying rider who had broken away from the lead group and was now lapping us. Dan, a local rider, was obviously going for the win and he dropped us like stones on the next ascent. Dan’s speed embarrassed me into making one last try to catch the lead group that he had left behind but I admitted defeat on what I calculated would be their penultimate lap and instead waited in Greenwich for them so I could do their last lap with them. As I waited (and waited) Dan came zooming around to finish and I realised that I must have been almost upon them when I stopped and that he had lapped them to take the win in fine style. They came through shortly afterwards and I had just one short lap in company before sadly watching them all peel off to the pub whilst I completed my final lap alone. Again. 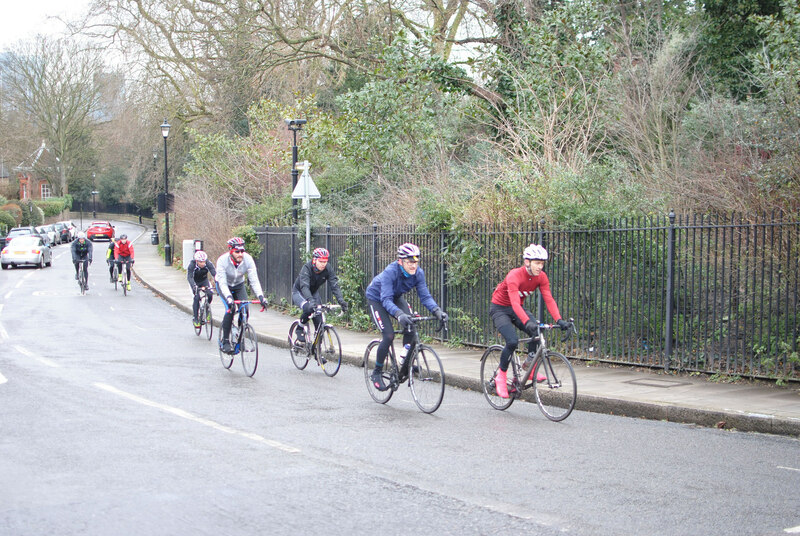 The cold, wet and loneliness of the final lap was countered by the warmth, dryness and sociability to be found in The Gipsy Moth pub immediately after our ride. GC winner Dan had long left by the time I arrived but many remained to toast old Henri’s health. 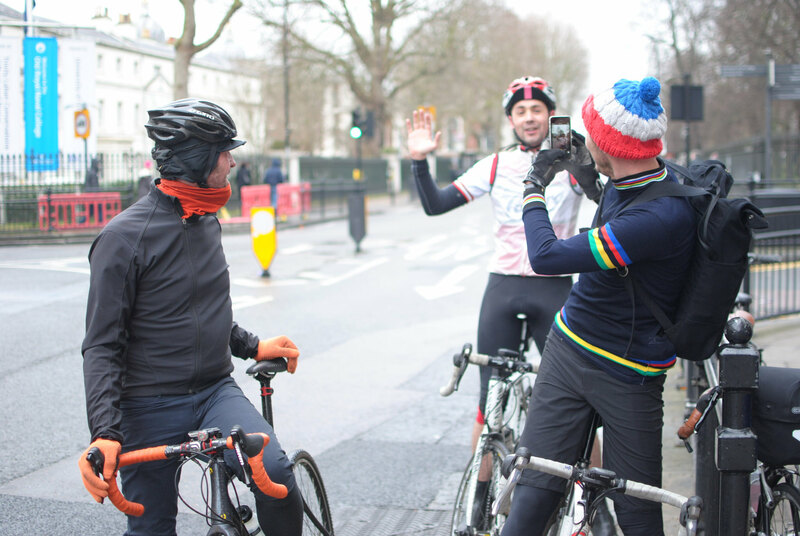 A casquette, kindly donated by The Friends of Herne Hill Velodrome, was awarded as the ‘Jacques Goddet Sartorial Elegance Prize’ to Felix Lowe – AKA Eurosport’s Blazin’ Saddles – for his double layer Cinzano jersey offering. The main prize of the day was the ‘Henri Desgrange Memorial Pignon Fixe Award’, given to a fixed or single speed rider in a nod to Henri’s general disgust at the use of “variable gears”. Howard Stredwick took home the coveted medal for his tenacity and strength on the climbs, which was made more impressive by the knowledge that he was toting a large heavyweight book in his backpack for the whole distance. Chapeau! That is just the sort of extra suffering that would get Monsieur Desgrange salivating. I’m very grateful to everyone who turned up and hope to see you all, plus a few more, back on the start line next year. 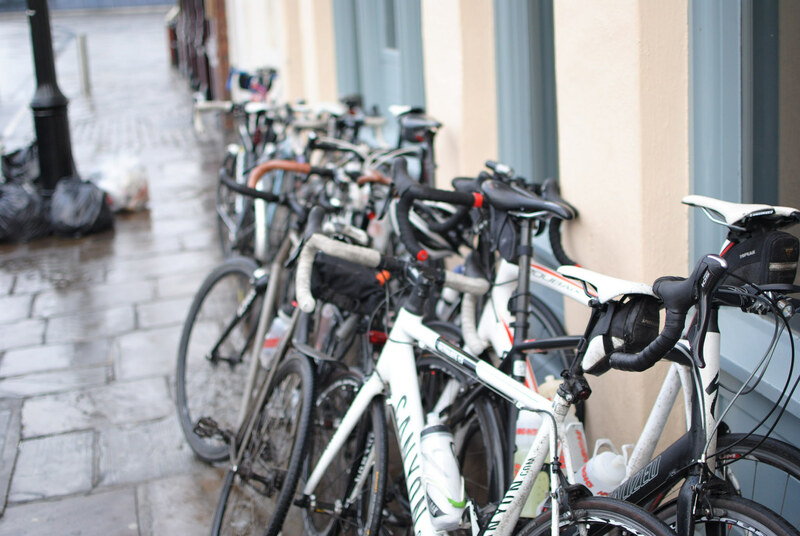 You all made the event a great success and the chat in the pub after was a grand reward for the earlier effort. Be warned though: there were 13 stages in the 1906 Tour de France and I’m hearing rumours that some pavé has been found locally..
Special thanks to Fasih Rehman for the use of some of the photos, and to Imke Himstedt for knitting the Tricolore Hat.. 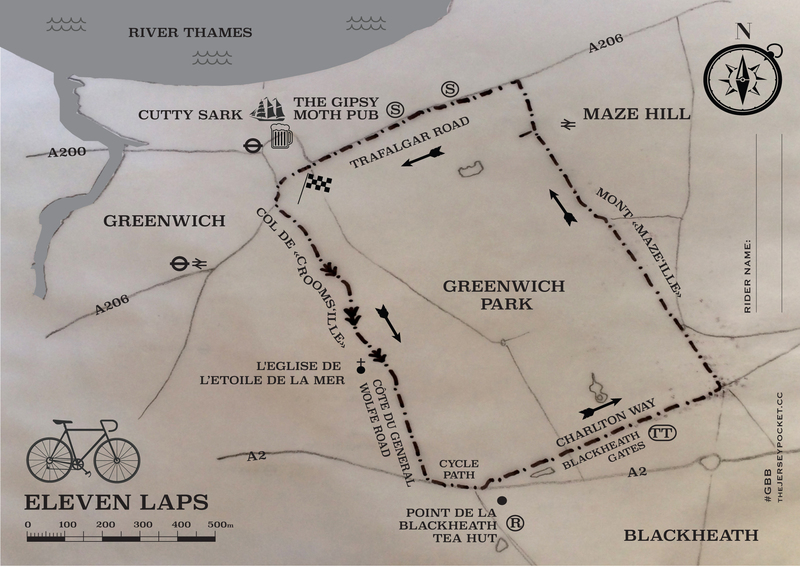 This entry was posted in Le Tour de France, Ride Reports and tagged crooms hill, cutty sark, Cycling, desgrange, greenwich, lfgss, maze hill. Bookmark the permalink.